Favourite backers were celebrating after the 11/8 market leader At Fishers Cross delivered a first Grade One success for Welsh trainer Rebecca Curtis when capturing the Albert Bartlett Novices' Hurdle. "It's amazing to win a first Grade One and hasn't really sunk in yet," admitted Curtis. "We were lucky to get the ground we wanted. I wouldn't rule out him going on better ground but he is proven on heavy so I was delighted when it started raining. He kept battling up the hill and is a little star. "We were delighted to have a winner last year and I thought we should make the most of it because they don't come around too often. But, to have another one this year, especially a Grade One, ups our game again and it is amazing. "We knew we had him fit and well so couldn't do any more. He is such a tough horse and I wouldn't bring anything here this week unless it had a realistic chance. It's very special to win for J P (McManus) and I'm also delighted for A P (McCoy) because he was getting a bit down having not had a winner so far this week. "He could be a Ladbrokes World Hurdle horse next season but he'll be a chaser eventually. I'll talk to Frank Berry and J P and see what they want to do." Owner J P McManus had no wish to spoil the pleasure for himself and other members of the At Fishers Cross team following the horse's win in the Albert Bartlett Novices' Hurdle, but he was mindful of a stricken friend. John Thomas (J T) McNamara has ridden countless winners for McManus over the years, but today he lies in Frenchay Hospital, Bristol, after sustaining a severe neck injury following a fall at The Festival yesterday. When heading to the winner's enclosure to welcome back his winner, McManus said: "It's always nice to have a winner in Cheltenham and it's just nice to have runners and to be here. The day is marred with sadness with what JT and his family are going through. We feel guilty for being here today because we feel we should be doing something to help him and I just wish we could. "With all that happened yesterday, to have a winner today - it doesn't seem right to celebrate. John Thomas' family are all in our thoughts and we just hope and pray that he gets better. "This is one of the highs and one of the great things about the meeting but, let me tell you, it doesn't compare with the sadness of yesterday. Let's hope that he is well. I am delighted to win the race and delighted to be here but it seems difficult to celebrate it when our friend needs our prayers. "Those jockeys give us so much pleasure, so much enjoyment. Everybody does in the game - lads, lasses, everybody - and we should be so thankful to them all. " Referring to his winner, he added: "A P rode him like the best horse in the race. I never thought about him as a Cheltenham horse, I had him more as a Pertemps horse throughout the year, but he worked his way into being a top novice and he quite a good horse on that ground." Jockey Tony McCoy was in a sombre mood after the Albert Bartlett Novices' Hurdle despite riding his first winner of this year's Festival on 11/8 favourite At Fishers Cross. McCoy was quick to pay tribute to both the late Campbell Gillies and injured J T McNamara following his four-length victory and to highlight the dangers that jockeys face every time they go out to ride. "It is very hard to be happy after what happened yesterday with J T McNamara," said McCoy. "Campbell Gillies won this race last year and he is not here so you have to enjoy these moments but it is very difficult. "At Fishers Cross has really turned a corner. He has a terrific attitude and he keeps finding - he is a horse you love to ride. "I am glad this fellow won for the boss because he was very upset last night after what happened to John Thomas. I'm also glad we have got some of Ronnie Bartlett's money but it is very hard to be happy today." Both African Gold and Inish Island, separated by a nose when second and third in the Albert Bartlett Novices Hurdle, will be going chasing next season. "What a future he will have over fences," said the runner-up's trainer Nigel Twiston-Davies. "I am so lucky to have a horse like him in the yard. And with The New One [winner of the Neptune Investment Management Novices' Hurdle on Wednesday] as well, these are exciting times." In the shorter term, African Gold, a five-year-old by King's Theatre, will run over hurdles at Aintree. "He's much better on better ground, and we did not welcome the rain that came," added Twiston-Davies. "The winner [At Fishers Cross] won well, fair play to him, but on different ground, who knows?" Willie Mullins, trainer of Inish Island, was equally pleased with his charge's run. "Chasing next year," he said. "That will be his job." The owners of both horses were having their first runners at the Festival. Inish Island carries the colours of the Flanagan family - siblings Susan, Hazel and Patrick - from Grangeclare, near the Curragh in Co Kildare, and African Gold is owned by Canadian-born, British-based Ron Bauer, in the mining industry. "He's the only one I've got in training," he said, "when you've got a horse this good trained by a man this good you don't need much more. He's my first runner at the Festival, but I hope not my last. The plan is to be back here next year." 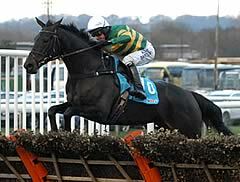 The Albert Bartlett Novices’ Hurdle is run over three miles and was added to The Festival in 2005. Initially sponsored by Brit Insurance, it was backed by Albert Bartlett for the first time in 2008, coinciding with its upgrade to Grade One status and carries prize money of £120,000. The largest field to go to post was 23 in 2011, while the smallest is 17 in 2009. No owner has won the Albert Bartlett Novices’ Hurdle more than once. Jonjo O’Neill has recorded two victories with Black Jack Ketchum (2006) and Wichita Lineman (2007). Robert Thornton and 17-time champion jockey A P McCoy have two wins each. Thornton scored on French raider Moulin Riche (2005) and Nenuphar Collonges (2008), while McCoy partnered Black Jack Ketchum (2006) and Wichita Lineman (2007). A mare has yet to win the Albert Bartlett Novices’ Hurdle. 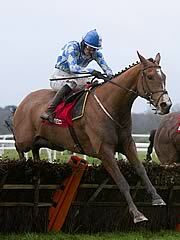 Black Jack Ketchum was sent off the even-money favourite in 2006 and duly justified his position in the market with an impressive nine-length success, while Berties Dream was the shock 33/1 winner in 2010. Three of the eight favourites have obliged. The oldest horses to win the Albert Bartlett Novices’ Hurdle are Black Jack Ketchum (2006), Nenuphar Collonges (2008), and Berties Dream (2010), who were all aged seven. The quickest winning time stands at 5m 38.30s, set by Black Jack Ketchum in 2006. Albert Bartlett sponsors three other races in the build-up to The Festival with Grade Two contests at Cheltenham (December 15), Doncaster (January 26) and Haydock Park (February 16). The Albert Bartlett Novices’ Hurdle has proved to be a good pointer to the RSA Chase in recent years. Bobs Worth and Weapons Amnesty, who captured the Albert Bartlett Novices’ Hurdle in 2011 and 2009 respectively, went on to win the RSA Chase the following season, while 2010 RSA Chase hero Bostons Angel had been pulled up in the previous year’s Albert Bartlett Novices’ Hurdle.